Painter and printmaker Robyn Denny’s geometric abstractions and collages captured the mood of the late 1950s and early 1960s.His style led the way in developing the Abstract Expressionist movement in Britain. In 1988 Denny was commissioned to create an artwork for Embankment station. Sitting on the bank of the River Thames, the station’s location provided inspiration; the curve of the river is broken down into a series of lines, each given a colour to create ribbons. Designs are found on the Northern, Bakerloo, District and Circle line platforms. 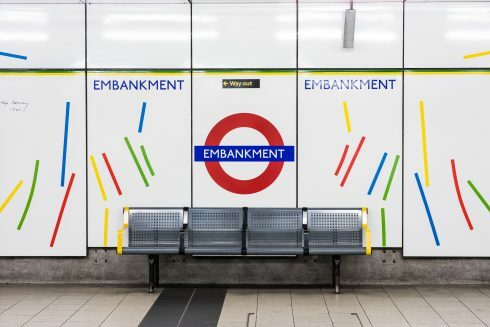 The colours used are those of the four Underground lines that serve Embankment station, with the addition of blue to represent the river and red to represent the Tube train itself. The artist’s signature is found on selected panels on each platform.